Schedule an advising appointment with your assigned advisor in the Academic Advising and Planning Center online with Appointment Manager. For more information, visit our Advising Appointments page. The AAPC offers Quick Question Drop-In (QQDI) advising hours from 2:00 p.m. - 4:00 p.m., Monday - Friday through the fall and spring semesters. For the Spring 2019 semester, we are also offering evening drop-in hours on Tuesdays from 5:30 p.m. - 7:30 p.m. QQDI is staffed by our Peer Advisors with a professional advisor available on call supporting the Peer Advisor. Please verify: Does your question qualify for Quick Question Drop-In advising? The Academic Advising and Planning Center offers Advise Me, a mobile advising texting platform. 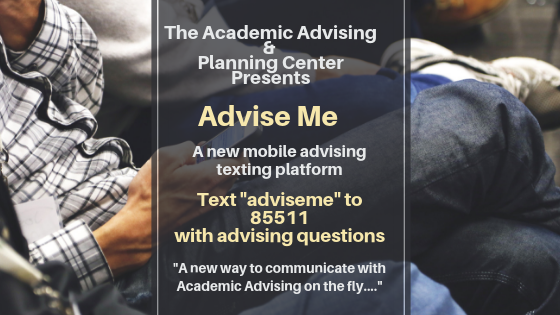 Text "adviseme" to 85511 with advising questions to communicate with Academic Advising on the fly. You can find your advisor's name via the Academic Profile box on the Academic Services tab in MyCharleston or by viewing your Degree Works audit. Newly admitted students will be assigned an academic advisor after attending New Student Orientation. Visit the Academic Advising and Planning Center Facebook page for frequent updates and tips.